The Soyuz TMA-18 spacecraft, moments before landing. Running one day late, a Russian Soyuz capsule carried two Russian cosmonauts and a NASA astronaut back to Earth early Saturday, the final chapter in an action-packed six-month mission aboard the International Space Station. 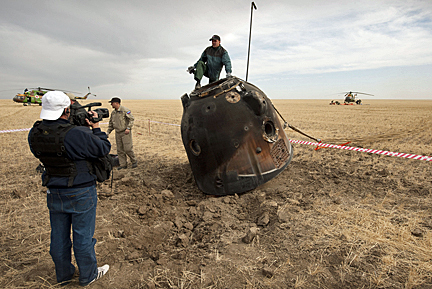 The charred descent module, awaiting crew extraction. Dropping through a clear sky under a huge orange-and-white parachute, the charred Soyuz descent module landed upright and on target near the town of Arkalyk at 1:23 a.m. EDT (11:23 a.m. local time). "And the search and recovery forces now report the Soyuz TMA-18 has landed," said Rob Navias, mission control commentator at the Johnson Space Center in Houston. "The soft landing engines reported to have worked perfectly. Alexander Skvortsov, Tracy Caldwell Dyson and Mikhail Kornienko, back on Earth after 176 days in space." Russian recovery forces, including NASA flight surgeons and support personnel, rushed to the landing site from nearby staging areas to assist Skvortsov, Kornienko and Caldwell Dyson as they began the process of re-adapting to Earth's gravity after 176 days in space. 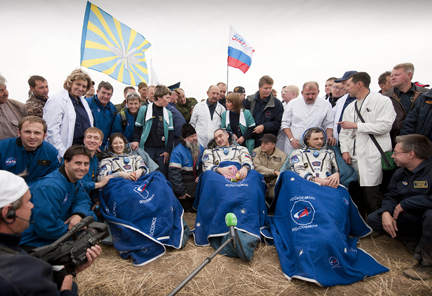 But all three appeared relaxed and in good spirits after they were assisted from the spacecraft, enjoying fresh fruit and chatting with recovery personnel. After initial medical exams, all three crew members were to be flown to Karaganda for a traditional Kazakh welcome. Skvortsov and Kornienko then planned to head for Star City near Moscow while Caldwell Dyson was scheduled to fly back to the Johnson Space Center in Houston aboard a NASA jet. Strapped into the Soyuz TMA-18 spacecraft, the same vehicle that carried them into orbit April 2, Skvortsov, Kornienko and Caldwell Dyson undocked from the space station's upper Poisk module at 10:02 p.m. Friday. An attempt to undock Thursday night was blocked by problems with a sensor in the docking mechanism holding the Soyuz to the Poisk docking port. After extensive troubleshooting, station flight engineer Fyodor Yurchikhin installed jumper cables that emulated the expected signals from a bypassed "hatch locked" sensor, restoring the docking system to operation. There were no problems during the second undocking exercise Friday and after moving the Soyuz a safe distance away, Skvortsov fired the ship's braking rockets for four minutes and 21 seconds starting at 12:31:17 a.m. Saturday. That slowed the craft by about 258 mph and put it on course toward the targeted landing site. After a half-hour free fall, the Soyuz TMA-18 descent module fell into the discernible atmosphere at an altitude of about 63 miles at 12:59 a.m. Parachute deployment was normal, and the capsule touched down without incident. The most dramatic moments of the crew's six months in space came at the end of July when one of the space station's two coolant loops shut down because of an ammonia pump failure. Forced to power down numerous space station systems to prevent overheating, the station crew quickly geared up for a complex three-spacewalk repair job by Caldwell Dyson and Douglas Wheelock. "What would historians write about this increment? Well, certainly the headline would be the pump module remove and replacement, the day the ammonia stopped flowing in loop A and the three dramatic spacewalks and all of the work that was involved to change those out in the limited amount of time we felt we had," Caldwell Dyson said before undocking. "I think historians could write a whole lot about that, everything from the problem itself to how this space station is so robust that it can withstand a failure like that. After the successful spacewalks, Caldwell Dyson told CBS News the experience was "awe inspiring." "You know, for the last four or five months I've been looking out our cupola window at the sunrises and sunsets and been brought to tears by the multitude of stars once the sun goes down," she said. "And I wondered just how I would feel when I went out there. "For me, my first EVA was a culmination of 12 years of training and being here and watching and learning and having a huge desire to do that. And so the feeling I was having out there, being on structure, outside the space station, was as emotional as you can get in an EMU (spacesuit), looking out at the sunrise for the first time. It was, like I said, a culmination of so much desire and years of training, it was a feeling I'll never forget." In an interview last week with ABC News, she said she would miss her two crewmates "because as soon as we land ... I get on a plane and I come right back to Houston and my two Russian crewmates, who I spent all my time with, I won't be able to see for a couple of weeks. "I'm definitely going to miss the views," she added. "I don't think there's a time I could enter the cupola with the intent of staring at the views and not get a little choked up thinking this might be the last time. But then I'm also encouraged by the fact that not too many people get to see that view and I try to take it in (so) I can help describe it to folks when I come back and help them feel a little bit of it. "The one thing I'm not going to miss is the lack of longevity in my toothbrush. I'm really looking forward to having running water," she laughed. The departure of Soyuz TMA-18 left the International Space Station with a crew of three: Expedition 25 commander Wheelock, Yurchikhin and Shannon Walker. They will have the station to themselves for the next two weeks before the arrival of three fresh crew members aboard an upgraded Soyuz TMA-01M spacecraft scheduled for launch Oct. 7. Dropping out of orbit, the Soyuz TMA-18 spacecraft fired its braking rockets for four minutes and 21 seconds early Saturday, putting the ship on course for a landing in central Kazakhstan. With commander Alexander Skvortsov at the controls, flanked by flight engineer Mikhail Kornienko and Tracy Caldwell Dyson, the de-orbit rocket firing began on time at 12:31:17 a.m. EDT, slowing the ship by about 258 mph. After a half-hour free fall, the three modules making up the Soyuz spacecraft will separate and the central descent module carrying the crew will hit the discernible atmosphere at an altitude of about 63 miles at 12:59 a.m. If all goes well, the spacecraft will touch down near the town of Arkalyk in central Kazakhstan around 1:21:53 a.m. EDT (11:21:53 a.m. local time). This status report will be updated after landing or as conditions warrant. Running a day late because of docking system problems, a Russian Soyuz spacecraft carrying two cosmonauts and a NASA astronaut undocked from the International Space Station late Friday, kicking off a three-and-a-half-hour descent to Earth to close out a six-month stay in space. With outgoing Expedition 24 commander Alexander Skvortsov at the controls in the Soyuz's center seat, the TMA-18 vehicle departed the Poisk module docking port at 10:02 p.m. EDT as the two spacecraft passed 220 miles above the Russia-Mongolia border. Strapped into a seat to Skvortsov's left was flight engineer Mikhail Kornienko. To his right was Tracy Caldwell Dyson. Unlike the crew's first attempt to head home Thursday night when trouble with hatch sensors forced a 24-hour delay, there were no problems of any significance Friday and the hatch, hot-wired to bypass a sensor problem, worked flawlessly. "We have separation," someone radioed as the Soyuz backed away. 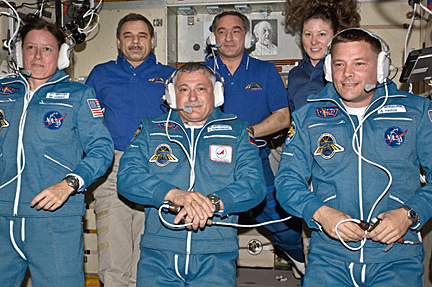 "Thank you, Fyodor, thank you to the entire crew," Skvortsov radioed Fyodor Yurchikhin and his two Expedition 25 crewmates, commander Douglas Wheelock and Shannon Walker. 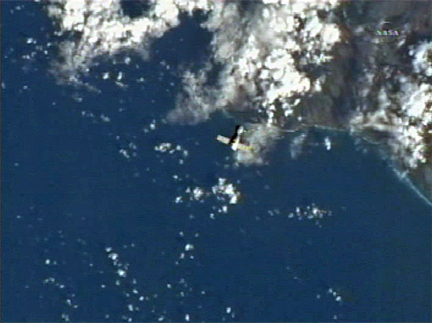 The Soyuz TMA-18 spacecraft passing above the Hawaiian islands. The fight plan called for Skvortsov to move the Soyuz spacecraft a safe distance away from the International Space Station before starting a four-minute 21-second deorbit rocket firing at 12:31:17 a.m. Saturday. The burn was designed to slow the spacecraft by about 258 mph, just enough to drop it out of orbit on a trajectory to Kazakhstan. After a half-hour free fall, the three modules making up the Soyuz spacecraft will separate and the central descent module carrying the crew, protected by a heat shield, will hit the discernible atmosphere at an altitude of about 63 miles at 12:59 a.m.
About six minutes later, Skvortsov, Kornienko and Caldwell Dyson will experience maximum deceleration as the descent module passes through an altitude of 21 miles. Two minutes after that, at 1:07 a.m., commands will be sent to begin deploying drogue chutes and the module's main parachute at an altitude of about 6.6 miles. Landing near the town of Arkalyk in central Kazakhstan is expected at 1:21:53 a.m. EDT (11:21:53 a.m. local time). Russian recovery crews are standing by to assist the crew and to help extract them from the cramped descent module. After medical checks, all three will be flown to Karaganda for a traditional Kazakh welcome home ceremony. Skvortsov and Kornienko will fly from there back to Star City near Moscow while Caldwell Dyson will board a NASA jet for a flight back to Houston. Describing a Soyuz re-entry earlier this week, Caldwell Dyson said "I've heard it described as a train wreck followed by a car crash followed by a falling off your bike kind of thing. ... All I can really say is I'm going to expect this to be 'Mr. Toad's Wild Ride' for me." 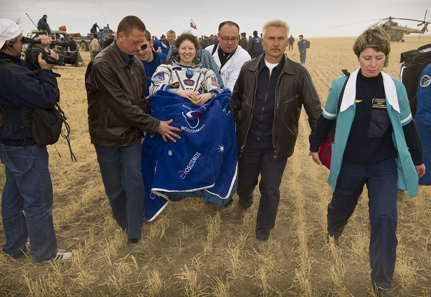 She said she was "really looking forward to being extracted from the Soyuz right where we're supposed to land and getting carried, like a princess, to my fur chair," referring to recliners the Russian recovery team provides for returning Soyuz fliers. "I've seen it happen dozens of time on television and I simply can't wait to feel what that chair is like," Caldwell Dyson joked. "Granted, I'll be slightly mesmerized by all the vestibular effects of entering one G, I hope that does not cloud the sensation of resting in a furry chair!" 25 flight engineer Fyodor Yurchikhin (red shirt) looks on. Outgoing Expedition 24 commander Alexander Skvortsov, flight engineer Mikhail Kornienko and NASA astronaut Tracy Caldwell Dyson bid their space station colleagues farewell for the second time Friday, returned to their Soyuz TMA-18 spacecraft and prepared for a day-late undocking and landing in Kazakhstan early Saturday to close out a six-month stay in space. The main hatch to the Soyuz was closed at 6:35 p.m. EDT, setting the stage for undocking from the upper Poisk module at 10:02 p.m. If all goes well, Skvortsov will oversee a four-minute 21-second de-orbit rocket firing starting at 12:31:17 a.m. Saturday, slowing the ship by about 258 mph and putting it on a trajectory for a landing near Arkalyk in northeastern Kazakhstan around 1:21:53 a.m. (11:21:53 a.m. local time). Touchdown will mark the end of a 176-day stay in space for Skvortsov, Kornienko and Caldwell Dyson since blastoff last April 2 aboard the same Soyuz TMA-18 spacecraft. The station's three remaining crew members -- Expedition 25 commander Douglas Wheelock, Shannon Walker and cosmonaut Fyodor Yurchikhin -- will have the outpost to themselves for the next two weeks until another Soyuz carrying three fresh crewmates arrives Oct. 9. Skvortsov and his crewmates had hoped to undock Thursday evening for a landing in Kazakhstan early Friday U.S. time. But they ran into problems when closing the hatches between the Soyuz spacecraft and its docking port atop the Poisk module. As reported early Friday, telemetry indicated the hatch was closed, but an expected signal showing it was firmly locked was absent. The Soyuz hatch was re-opened and inspected and then resealed as was a cover on the station side of the interface. But again, flight controllers did not see a locked indication. With air pressure holding steady, the crew carried out an extended leak check to verify the integrity of the seals. Flight controllers then attempted to drive open hooks in the Poisk side of the docking interface that help hold visiting spacecraft in place. The hooks failed to retract. Skvortsov attempted to open the hooks by sending commands from inside the Soyuz but again, the hooks refused to budge. With time running out, Russian flight controllers were forced to delay undocking pending additional troubleshooting. They eventually decided to delay the departure a full day. Inspecting the Poisk side of the hatch, station flight engineer Fyodor Yurchikhin found a small, apparently damaged seven-toothed sprocket floating in the docking mechanism when he removed a protective cover for an inspection. The dislodged sprocket may have prevented the hatch lock sensor from working properly. To work around the problem, Yurchikhin installed electrical jumpers that sent the proper signals to the docking system indicating a firmly closed hatch. The hooks then retracted normally. The jumper cables will remain in place until the arrival of the next set of crew members on Oct. 9. It is not yet clear whether the mechanism will be repaired or whether permanent jumpers will be installed. With a temporary fix in place, outgoing Expedition 24 commander Alexander Skvortsov, flight engineer Mikhail Kornienko and NASA astronaut Tracy Caldwell Dyson should be clear for another attempt to depart the space station Friday evening. A preliminary timeline calls for the departing crew to re-enter the Soyuz TMA-18 spacecraft and close its main hatch around 6:45 p.m. EDT, setting up a second attempt to undock from the Poisk module around 10:02 p.m. If all goes well, Skvortsov will oversee a four-minute 21-second de-orbit rocket firing around 12:32 a.m. Saturday, setting up a landing in Kazakhstan around 1:21 a.m.
Wrapping up a six-month stay in space, Skvortsov, Kornienko and Caldwell Dyson had hoped to undock Thursday evening for an early Friday touchdown, but they ran into problems when closing the hatches between the Soyuz spacecraft and its docking port atop the Poisk module. Telemetry indicated the hatch was closed, but an expected signal showing it was firmly locked was absent. The Soyuz hatch was re-opened and inspected and then resealed as was a cover on the station side of the interface. But again, flight controllers did not see a locked indication. With air pressure holding steady, the crew carried out an extended leak check to verify the integrity of the seals. A NASA spokesman said the jumper cables will remain in place until a Soyuz carrying three fresh crew members arrives for a docking at the Poisk module on Oct. 9. It is not yet clear whether the mechanism will be repaired or whether permanent jumpers will be installed. But with the temporary jumpers in place, engineers believe the arriving Soyuz will have no problems linking up with the space station. Russian flight controllers told their NASA counterparts early Friday they hope to make another attempt to undock the Soyuz TMA-18 spacecraft Friday night, setting up a landing in Kazakhstan early Saturday. Additional details, and an updated timeline, will be posted as soon as possible. Delayed more than three hours troubleshooting problems with the docking mechanism holding a Soyuz spacecraft to the International Space Station, Russian flight controllers called off an attempt to bring three crew members back to Earth Friday pending additional work to resolve the malfunction. The unprecedented glitch with the normally reliable docking mechanism means outgoing station commander Alexander Skvortsov, flight engineer Mikhail Kornienko and NASA astronaut Tracy Caldwell Dyson will have to spend at least one and possibly two more days in orbit. It was not clear what caused a lack of response with hooks on the space station side of the docking interface that are designed to release on command. But Expedition 25 flight engineer Fyodor Yurchikhin, examining the docking interface later from inside the space station, reported finding a small gear floating from the mechanism when he removed a cover. gear that floated from a malfunctioning docking mechanism. "Right under the cover, I could see... there is a small thing, it looked like a gear," he said. "It was under the cover of the panel so I could actually see it for a second. I am trying to reach under it, but the docking mechanism is in the way. But there was some small object that was floating there. That I can confirm. ... 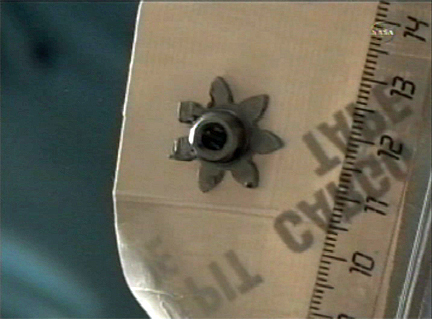 It's very small, it was looking very much like a spiral, like a gear with teeth." He later recovered the object, confirmed it was a small gear-like component and downlinked photos to Russian flight controllers. But it was not immediately clear whether the object came from the docking system or had anything to do with its failure to respond to commands. Skvortsov, Kornienko and Caldwell Dyson remained inside the Soyuz TMA-18 spacecraft while troubleshooting continued. They had hoped to undock from the station's upward-facing Poisk module at 9:35 p.m. EDT Thursday, setting up a landing in southern Kazakhstan at 12:55 a.m. Friday (10:55 a.m. local time) to close out a 175-day stay in space. The trio entered the Soyuz TMA-18 spacecraft late Thursday afternoon and closed the main hatch at 6:35 p.m. They immediately ran into problems getting a tight seal and were forced to open the Soyuz hatch again for a quick inspection. The hatch later was sealed, but Yurchikhin had problems confirming a tight fit with the hatch on the station side of the interface. After an extended leak check, flight controllers in Moscow decided the docking interface was tight and leak free. As the countdown ticked toward undocking, commands were sent to open hooks on the Poisk side of the interface. But the mechanism failed to respond. Unable to figure out what might be causing the problem, chief flight director Vladimir Solovyov in the Russian mission control center ordered a one-orbit wave off pending additional troubleshooting. That later was extended to two orbits. 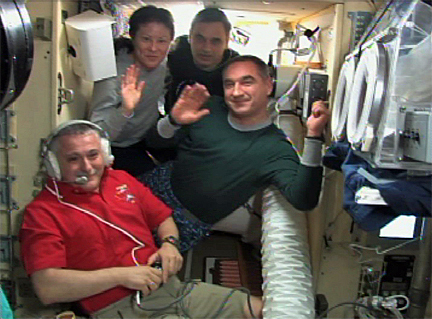 Skvortsov and his crewmates only had three opportunities on successive orbits to make it back to Kazakhstan on Friday. The station fliers were hoping to get away on their third and final opportunity, undocking around 12:40 a.m. EDT Friday. That would have set up a four-minute 21-second de-orbit rocket firing at 3:14:35 a.m. with landing in northern Kazakhstan near Arkalyk expected around 4:05 a.m. (2:05 p.m. local time). But engineers were unable to resolve the problem with the docking mechanism and Solovyov called off the undocking attempt. Skvortsov, Kornienko and Caldwell Dyson were cleared to doff their pressure suits, open the Soyuz hatch and return to the space station. "Fyodor, well, we're not going to have another attempt today for the undocking," a flight controlled called from the Russian mission control center. "Why don't you give the guys the go for opening the hatch and coming back to the ISS. All the details will be given later ... about the planned undocking either tomorrow or the day after tomorrow." Russian flight controllers have told Soyuz TMA-18 commander Alexander Skvortsov that undocking from the International Space Station will be delayed at least two orbits -- about three hours -- pending additional troubleshooting to resolve a problem with the docking mechanism holding the vehicle to the lab complex. Skvortsov, flight engineer Mikhail Kornienko and Tracy Caldwell Dyson, wrapping up a six-month stay in space, have three opportunities on successive orbits to land in Kazakhstan on Friday. Assuming the problem can be resolved and the crew is cleared to take advantage of the third and final opportunity, undocking would be expected around 12:40 a.m. EDT Friday. That would set up a four-minute 21-second de-orbit rocket firing at 3:14:35 a.m. with landing in northern Kazakhstan near Arkalyk expected around 4:05 a.m. (2:05 p.m. local time). The landing zone for the third opportunity is about 250 miles northwest of the originally planned target near Dzhezkazgan, Kazakhstan. Rob Navias, the mission control commentator at the Johnson Space Center in Houston, said the problem apparently involves hooks and latches in the Russian Poisk module's docking system that helps hold the Soyuz TMA-18 spacecraft in place. "There are gangs of hooks and latches on both sides of the docking interface that open sequentially to enable the two vehicles to separate from one another for a nominal undocking," he said. "Repeated attempts by the crew to send commands to drive open the gangs of hooks and latches on the Poisk module side of the docking interface proved unsuccessful. So our undocking opportunity came and went." The Soyuz crew remains in place "with hatches closed, a good air-tight seal between the Soyuz and the International Space Station," Navias said. "The Russian fight control team, after assessing its options, told the crew that they were going to delay undocking for two orbits with the final orbit of the day available for the Soyuz to reach its landing site in Kazakhstan. ... That basically delays everything by about three hours or so." After resolving problems ensuring air-tight seals between the Soyuz TMA-18 spacecraft and the International Space Station's Poisk module, the crew ran into trouble commanding hooks in the module's docking mechanism to open as required for the capsule's departure. After multiple unsuccessful attempts to correct the problem, Russian flight controllers ordered a delay in the spacecraft's undocking pending resolution of the issue. The Soyuz TMA-18 spacecraft, carrying outgoing station commander Alexander Skvortsov, flight engineer Mikhail Kornienko and Tracy Caldwell Dyson, is docked to the Poisk module, which in turn is attached to the upper port of the Russian Zvezda command module. The trouble appeared to involve the hooks on the Poisk side of the docking interface. Earlier Thursday, the hooks were commanded open and then were closed again as part of normal undocking preparations. But when Skvortsov sent commands to open the hooks for the actual departure, originally scheduled for 9:35 p.m. EDT, the mechanism failed to respond. Following instructions from Russian flight controllers, Skvortsov sent a variety of computer commands to coax the mechanism back into operation, but he was not successful. 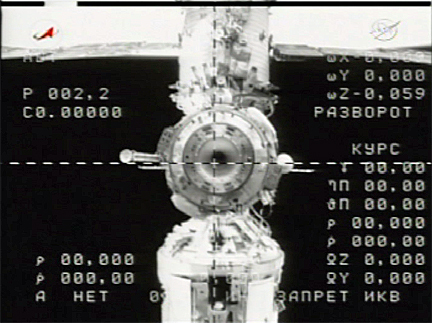 As a result, the docking was delayed at least one 90-minute orbit pending additional troubleshooting. The original flight plan called for Skvortsov and Kornienko to fire the spacecraft's braking rocket for four minutes and 21 seconds, starting at 12:04:23 a.m. Friday, to slow the Soyuz by about 258 mph and begin the descent to Earth. 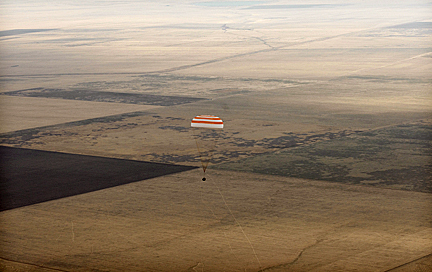 Landing near the town of Dzhezkazgan, Kazakhstan, was expected around 12:55:44 a.m. (10:55:44 a.m. local time). The Soyuz crew was not in any danger because of the malfunction, but it is not yet clear how the undocking delay might affect the eventual landing time. After extensive troubleshooting, leak checks confirmed air-tight seals between the departing Soyuz TMA-18 spacecraft and the International Space Station's Poisk module. Outgoing Expedition 24 commander Alexander Skvortsov, Mikhail Kornienko and NASA astronaut Tracy Caldwell Dyson entered the TMA-18 vehicle and closed the hatch around 6:35 p.m. EDT to set the stage for undocking and landing early Friday in Kazakhstan. Telemetry indicated problems with the seal between the Soyuz and Poisk and the hatches were re-opened to inspect the mechanism. No problems were found but microswitches continued to indicate possible problems. After additional troubleshooting, Russian flight controllers carried out leak checks to confirm the integrity of the seal. 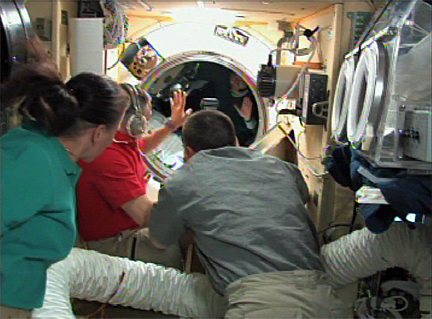 Finally, two hours after the initial hatch closure, engineers concluded the problem had been resolved. Undocking remains scheduled for 9:35 p.m.
Cosmonauts Alexander Skvortsov, Mikhail Kornienko and NASA astronaut Tracy Caldwell Dyson moved back aboard the Soyuz TMA-18 spacecraft that carried them into orbit six months ago and prepared for undocking and landing early Friday in Kazakhstan. "The hatch is closed," Skvortsov radioed from inside the Soyuz at 6:35 p.m. EDT. But telemetry indicated an air-tight seal had not been achieved and Skvortsov was asked to re-open the hatch to inspect the mechanism. No obvious problems were found and the hatch was re-closed. Again, telemetry indicated the seal between the Soyuz and the space station might not be air tight. The cosmonauts reported the mechanism appeared to be working normally and flight controllers focused on the space station side of the hatch. While additional leak checks were carried out, the returning crew members began donning their pressure suits to prepare for undocking. In video downlinked earlier from the space station, the departing crew members could be seen embracing their three station colleagues -- Expedition 25 commander Douglas Wheelock, Shannon Walker and cosmonaut Fyodor Yurchikhin -- sharing hugs and handshakes as they made their way to the Soyuz. 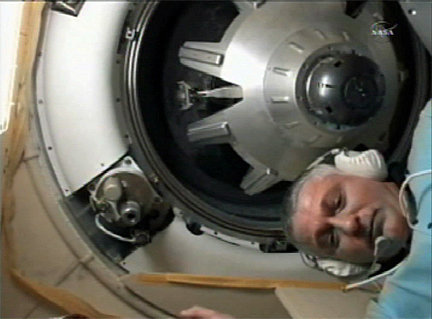 If all goes well, Skvortsov, serving as Soyuz commander in the capsule's center seat, will undock from the Poisk module atop the Russian Zvezda command module at 9:35 p.m.
"Most of the work will be done by my two Russian crewmates as they prepare our vehicle to undock and come back home," Caldwell Dyson said earlier. "At some point, we'll put on our ... launch and entry suits and climb into our seats and get ourselves strapped in and braced." After moving a safe distance away from the space station, Skvortsov and Kornienko plan to fire the spacecraft's braking rocket for four minutes and 21 seconds, starting at 12:04:23 a.m. Friday, to slow the Soyuz by about 258 mph and begin the descent to Earth. Landing near the town of Dzhezkazgan, Kazakhstan, is expected around 12:55:44 a.m. (10:55:44 a.m. local time). Caldwell Dyson said she was looking forward to her first descent in a Soyuz spacecraft after hearing fellow NASA astronauts describe the experience. "I've heard it described as a train wreck followed by a car crash followed by a falling off your bike kind of thing," she said. "All I can really say is I'm going to expect this to be 'Mr. Toad's Wild Ride' for me." She also said she was looking forward to a fresh apple, a traditional gift from the recovery team. Outgoing Expedition 24 commander Alexander Skvortsov, cosmonaut Mikhail Kornienko and NASA astronaut Tracy Caldwell Dyson geared up to undock from the International Space Station Thursday evening, setting the stage for a landing early Friday in Kazakhstan to close out a six-month stay in space. The Soyuz TMA-18 spacecraft, the same vehicle that carried the trio into orbit last April 2, is scheduled to undock from the Poisk compartment atop the Russian Zvezda command module at 9:35 p.m. EDT. A four-minute 21-second deorbit rocket firing is planned for 12:04:23 a.m. Friday, setting up a landing near the town of Dzhezkazgan around 12:55:44 a.m. (10:55:44 a.m. local time). "All of the aircraft that will be supporting the landing are indeed ready, as well as the operations teams themselves," NASA spokesman Josh Byerly said in a morning update from Kazakhstan. "There will be 12 Russian military helicopters that will support the landing activity," he said. "Eight of them departed earlier today and headed down to the city of Dzhezkazgan. That is considered the forward staging area. Four more helicopters will leave later on tonight, right before the landing itself." Along with Russian recovery forces, a team of flight surgeons was in place to assess the health of the returning station fliers and to assist them as needed as they begin re-adjusting to the unfamiliar tug of Earth's gravity after 175 days in space. "There's going to be a lot that I miss," Caldwell Dyson told ABC News last week. "I'm going to miss all my crewmates because as soon as we land, if we land in our primary landing site, I get on a plane and I come right back to Houston and my two Russian crewmates, who I spent all my time with, I won't be able to see for a couple of weeks. "I'm definitely going to miss the views," she said. "I don't think there's a time I could enter the cupola with the intent of staring at the views and not get a little choked up thinking this might be the last time. But then I'm also encouraged by the fact that not too many people get to see that view and I try to take it in (so) I can help describe it to folks when I come back and help them feel a little bit of it. With the departure of the Soyuz TMA-18 spacecraft, the space station's remaining three crew members -- commander Douglas Wheelock, Shannon Walker and cosmonaut Fyodor Yurchikhin -- will serve as the core members of the Expedition 25 crew. They will have the lab complex to themselves for about two weeks before three fresh crew members -- cosmonauts Alexander Kaleri, Oleg Skripochka and former shuttle commander Scott Kelly -- arrive Oct. 9 aboard an upgraded Soyuz TMA-01M spacecraft.